To contribute to a deeper understanding of interspecific relations between wood and tree size variables, 23 angiosperm tree species in two East African rain forests were investigated. The tree size variables were maximum tree height, maximum diameter, and maximum crown area. Wood was analyzed in regard of the physical variables specific gravity, water and gas fraction as well as the chemical variables carbon content and nitrogen content. All three tree size variables showed a significantly positive relation to each other. The wood physical variables showed negative correlations between the gas fraction and both specific gravity and the water fraction. Also positive relations were found between the water fraction and nitrogen content and between wood specific gravity and carbon content. 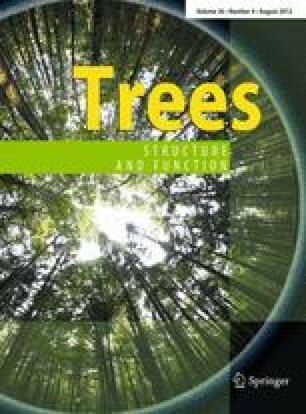 Between tree size and wood physical variables, the gas fraction showed positive relations to both maximum tree height and diameter, while wood specific gravity was negatively related to maximum tree height and diameter. No significant correlations were found between the wood physical variables and the maximum crown area. Relationships among tree size variables can be explained by static constraints, while relations between the wood physical variables can be explained by a trade-off underlying structure and survival to support the species specific life strategy and tree architecture. We thank the following people for assistance in the field: J. & N. Sajita, L. Barasa, C. Analo, J. “Blue” Andaye, G.M. Eriksson and B. Dumbo as well as Fred “Magic” Misoga for the nutritional support. We thank the Kenyan Ministry for Education and Research for permission to carry out this study and the Kenyan Wildlife Service (KWS) for granting us access to the Kakamega Forest national reserve. We thank the National Forest Authority of Uganda and the Budongo Forest conservation field station for permission to carry out the study in the Budongo Forest reserve. We thank Pamela Gliniars for helping to improve the English of this article and for her comment on earlier versions of the draft. We thank the communicating editor A. Franco and two anonymous reviewers for their constructive comments, which helped to improve the manuscript. We also thank the German Federal Ministry of Education and Research, which funded this study within the framework of BIOTA East Africa FKZ: 01LC0625F1.